Helxine (Soleirolia soleirolii): growing, planting, caring. A cute little creeping herb ! Helxine is a delicate-looking creeping herb with juicy bright green or yellow leaves and multitudes of tiny white flowers. It grows close to the ground in mats and is sometimes used in ornamental gardens. 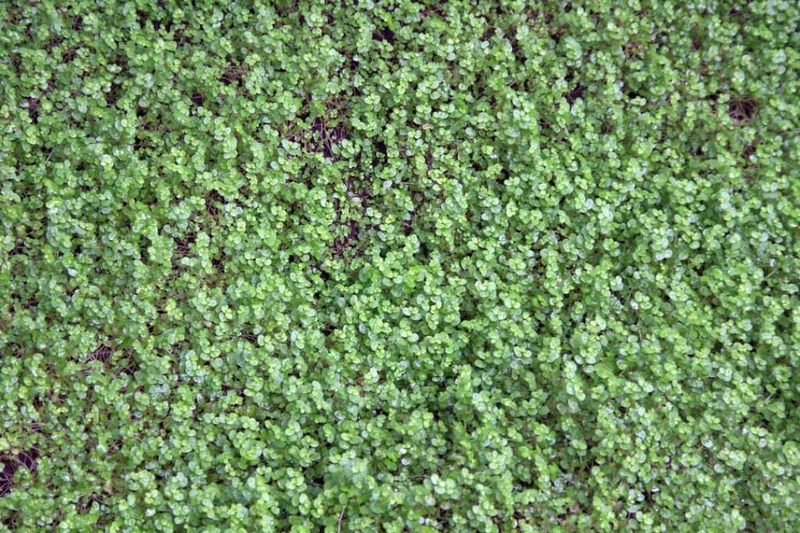 Easy : it forms very very low carpets of small round leaves. It grows in the same places as moss, in the shade, on thin soils. It does not appreciate alkaline soils. There exists varieties of different colors, even yellow ones. Plant in a rich in humus, light, slightly clayey, neutral or acidic soil in shade, during spring or fall. Be careful, the Soleirolia freezes below -10 ° C. Find a spot sites where the soil is thin, so your helxine will not be competing with vigorous plants. You can also plant it under trees and shrubs. When planting, add garden compost to the soil to lighten it if necessary. Soak copiously the root ball, then place your Soleirolia in its final location. Above all, it should not be buried too much. Water copiously. Plant your potted Soleirolia indoors in very fibrous soil, with some clay and compost. You can also plant it at the base of another houseplant. Sprinkle with non chlorinated and non-calcareous water your helxines indoors. Outside, unless you are in dry climate, as long as they are in the shade they are resistant to drought - we remind you that they come from Corsica. In case of very cold winter, place a thin layer of mulch on your helxine before the cold weather. You will have to think about removing it at the end of winter. If you see your Solerolia turn black, it is because it receives too much water. If it happens in winter, your it has frozen. A carpet of yellow Solerolia has dried. If it browns, then the earth is too wet for it. And finally, if the stems are long and not much leafy, it is because it lacks light.